The calendar says it's Friday, but it sure feels like Saturday in the sated aftermath of Thanksgiving Day. If you're not out shopping, let's talk about yesterday's wines. Seeking interesting, easy-drinking wines that would go well with turkey and the trimmings, I came up with a rustic Italian red, a luscious California white blend and a palate-cleansing German Pinot Noir.  Let's skip Black Friday! Here's a cheeky idea! While everbody else is out fighting traffic and crowds, let's stay home and shop for wine gifts on the Internet! When you buy these items, you also help support The 30 Second Wine Advisor. It's Friday, the sleepy day after Thanksgiving in the U.S. Most of us are taking the day off to make it a long weekend as we recover from yesterday's feasting excesses; and it feels an awful lot like Saturday. The calendar says it really is Friday, though, and that means it's time for another 30 Second Wine Advisor, even if quite a few of you who get your mail at work won't be there to see it. And, I expect, a lot more of you will be out shopping until you drop on "Black Friday." Enjoy your mall trips, and please pardon me if I don't venture out to join you. With more feasting ahead as we move toward Christmas and the holiday season - not to mention all those turkey leftovers that need to be eaten - it makes sense to devote today's space to the wines I chose to go with Thursday's traditional banquet. As the wine provider for a convivial group of friends and family who enjoy drinking wine but aren't really of the hard-core wine-geek persuasion, I veered away from cellar treasures and offbeat discoveries this holiday, in favor of interesting, easy-drinking wines that I thought would go well with the roast turkey and all the trimmings that weigh down the Thanksgiving table. Faced with lots of possibilities, I ended up with three wines that, in one way or another, followed the suggestions that I offered in Monday's Wine Advisor: A "heritage wine," an Italian Barbera d'Asti, made an excellent companion with light and dark turkey with its light, earthy character and tart, snappy acidity. A rather full, round white wine from California - a textured blend of Chardonnay, Viognier and Chenin Blanc - was a delight with the turkey, particularly the more delicate white meat. 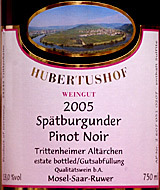 And it just about goes without saying that a Pinot Noir - perhaps the most versatile of food wines, even in the unusual alternative of a German "Spätburgunder" version - went well with everything on the table. An eclectic mix of grapes and California sources, this unusual white brings together 53% Chardonnay, 27% Viognier and 20% Chenin Blanc from Mendocino (53%), Lodi (27%) and Clarksburg (20%) in a luscious blend that sees long, cold fermentation on the lees but no oak aging. Clear straw color, with an appetizing scent of white fruit and honey; just off-dry (0.4% residual sugar), on the full side of medium-bodied. It offers a bowl of bananas, pears and peaches on the palate with slight sweetness well-balanced by appropriate acidity. A very interesting wine and a very good value from California Wine Club. Here's a cheeky idea! While everbody else is out fighting traffic and crowds and getting thoroughly out of the holiday spirit, let's stay home and shop on the Internet! These quick suggestions will please your wine-loving friends, and you purchase through the links provided, will put a few pence in our stockings at WineLoversPage.com. WINE GRAPE VARIETAL TABLE: One of the most innovative wine-enthusiast publications I've seen yet, Steve and Deborah De Long's Wine Grape Varietal Table mimics the familiar periodic table of the elements to categorize a world of wine grape varieties. "A wine reference disguised as a fine-art print," it's a great gift for a wine-loving friend - or yourself - and makes a fun wall display for cellar or study or tasting room. SCHOTT ZWIESEL WINE GLASSES: Just about every wine enthusiast knows by now about Riedel glassware from Austria, the classy, elegant crystal wine glasses made in dozens of shapes purported to suit specific wines. If you want to get just a bit closer to the cutting edge, check out German Schott Zwiesel, a line of similarly elegant glasses with a delicious nuance: They're made with titanium, not lead, and are virtuall unbreakable. No absolute guarantees - this is eggshell-thin crystal - but they're dishwasher safe, and we have reports of glasses bouncing back up undamaged after being dropped on a tile floor. Better still, all this style comes at a price that's appropriate for luxury but that more than meets the competition. Schott Zwiesel Diva Tritan Crystal Burgundy/Pinot Noir Wine Glasses, Set of 6: List price $75, discounted to $64.95 from Amazon.com, a 13 percent saving. Just out this month, my first anthology of 30 Second Wine Advisor articles, reassembled in easy, intuitive format to walk the novice or even the experienced wine lover though a casual introduction to wine appreciation. Taste by taste, day by day, these quick bites build your wine knowledge and enhance your confidence in the sometimes daunting world of fine wine. A great gift for anyone who wants to feel more comfortable about wine as a hobby as well as a drink.